The British government has become the majority shareholder in Lloyds Banking Group PLC in exchange for insuring more than £260 billion ($367 billion) in toxic assets, the bank said Saturday. The deal means the government's stake in Britain's third-largest bank will surge from 43.5 percent currently to at least 65 percent and possibly as high as 77 percent. As a condition for the deal, Lloyds promised to increase lending - primarily to businesses - by £28 billion ($39 billion) over the next two years. Eric Daniels, the group's chief executive, said in a statement that the deal "substantially reduces the risk profile of the group's balance sheet. Our significantly enhanced capital position will ensure that the group can weather the severest of economic downturns and emerge strongly when the economy recovers." Lloyds is the second bank to take part in the government's asset protection program after Royal Bank of Scotland PLC last month announced it would ask the state to insure £325 billion of risky assets. Lloyds was forced to turn to the program, which the government hopes will stabilize the country's shaky banking system, after sustaining heavy losses from its January takeover of HBOS. That deal had already led to a £17 billion bailout, which saw the government pick up its current stake, and the bank said that more than 80 percent of the £260 billion to be insured comes from HBOS' lending books. Under the asset protection program, banks pay a fee to have bad loans underwritten by the government, giving them more flexibility to lend to individuals and businesses. Lloyds said its assets covered are expected to include some £74 billion in residential mortgages, £18 billion in unsecured personal loans, and £151 billion in corporate and commercial loans. Lloyds has negotiated a £15.6 billion fee to be paid over seven years. The money will be used by the Treasury to subscribe to the issue in nonvoting "B" shares. Stephen Timms, the Treasury's chief secretary, told the BBC there was uncertainty over the true value of the assets, but that he believed the deal would help position Lloyds for the future as a strong financial institution. He also said the ultimate cost to the taxpayer was unclear. "What we have seen elsewhere where similar arrangements have been made is that some fraction of the total value of the assets held is ultimately a cost to the taxpayers, but it will be some years before the total cost becomes clear," Timms said. The government can convert its nonvoting holding into ordinary shares at a cost of 115 pence - nearly three times the 42 pence closing price on Friday. If it chose to do this, and took up the full £4 billion conversion of preferential into voting shares, then the taxpayer would own 77 percent of ordinary shares, though Lloyds said that the government had agreed to restrict its voting rights to 75 percent. The deal puts further pressure on Daniels and chairman Victor Blank, who agreed the ill-fated deal to buy HBOS, which earlier this month reported a full-year loss of £7.5 billion, compared with a profit of £4.05 billion in the previous year. 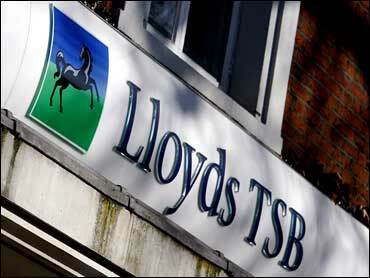 The group's Lloyds TSB unit reported an £819 million profit. When Lloyds rescued HBOS and the government picked up its initial stake, the bank said it did not want the government to take a majority investment, regarding the state as simply another investor.